Believe it or not! -- Another massive volume, the seventh in the bestselling Ripley's Believe It or Not series, was just released on August 10th, 2010. Enter if You Dare has an eye-catching lenticular image on the cover and plenty of bizarre and strange new entries inside. Just the other day, I took several books to the library to donate. Our librarian was especially excited to see one particular book in the stack, last year's Ripley's Believe or Not: Seeing Is Believing. Apparently the Ripley's Believe it or Not and Guinness World Records books are pretty popular at the library, and our children's librarian likes to take them with her on school visits. She's not the only one that has witnessed the popularity. The Getting Boys to Read website lists Ripley's Believe it or Not books on the Books For Boys - The 8 Most Popular Topics. Bizarre and gross win out with certain audiences. 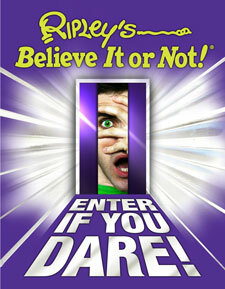 What's inside Ripley's Believe It or Not: Enter If You Dare!? The question should be, what's not in the book? The Wisconsin entries always catch my attention. This year's top WI honor goes to Ken Imhoff, a man who spent 17 years building a sports car in his cellar and had to remove part of his home's foundation to get the car out. There are the animal-themed oddities: a bright pink dolphin (page 59), calf with three nostrils (page 50), a spider with marking like a happy face (page 70), and a life-size buffalo made of pink chewing gum (page 184). There are people: a couple covered in bees for their wedding (page 158), a Pokemon collector (page 230) and an ice-breaking man (page 156). And then, of course, there are numerous stomach-turning, just plain graphic images that only adults and older children should view. I always turn to the art pages first; the art chapter in this volume is titled, "Artistic License." The amazing and stunning creations always interest me. I especially like the page spread on Chinese Artist Liu Bolin, the "Invisible Man," who paints himself into the background (page 198). Patrick Acton, an Iowaian, is shown with his detailed model of Hogwarts school from matchsticks (page 205). I'd love to see Edgar Mueller's 3D pavement art in person (page 208), but I really could have done without the image of Leandro Granato shooting paint out of his eye (page 195). Yes, it definitely is the "Yearbook of the Weird," and there's certainly a lot to take in. Not really a book you read cover to cover, but rather a browse and ponder kind of book. 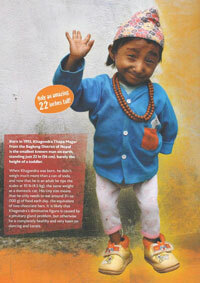 If this sort of news interests you, according to the Ripley's website, today (September 7th), the world's smallest teen, Khagendra Thapa Magar, is set to visit New York. 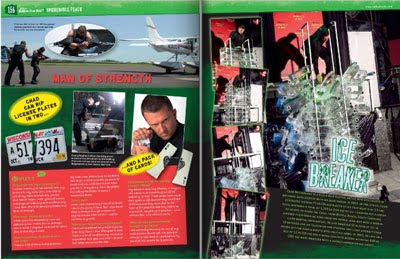 You can follow news related to his visit at http://www.ripleybooks.com/smallestman/.